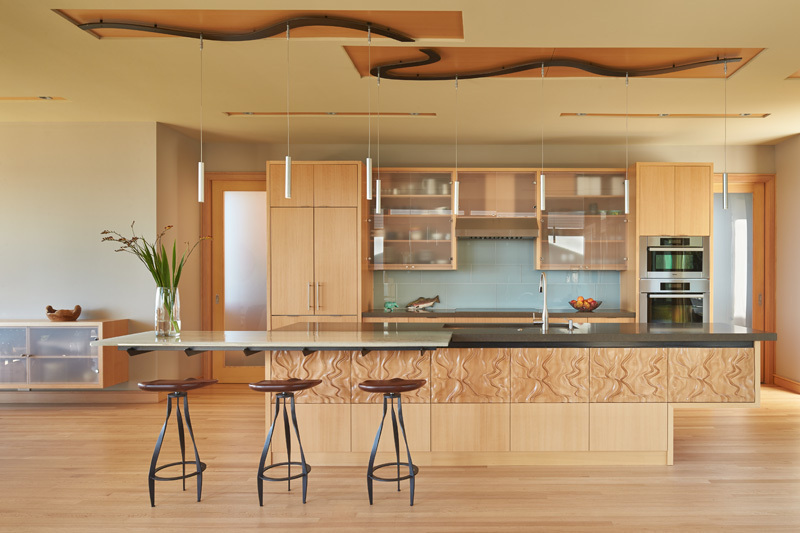 Nils Finne of FINNE Architects, has sent us one of his recently completed projects, the Elliot Bay House, located in Seattle, Washington. 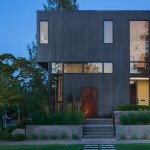 The Elliott Bay House is located in Seattle on a narrow site facing Puget Sound. 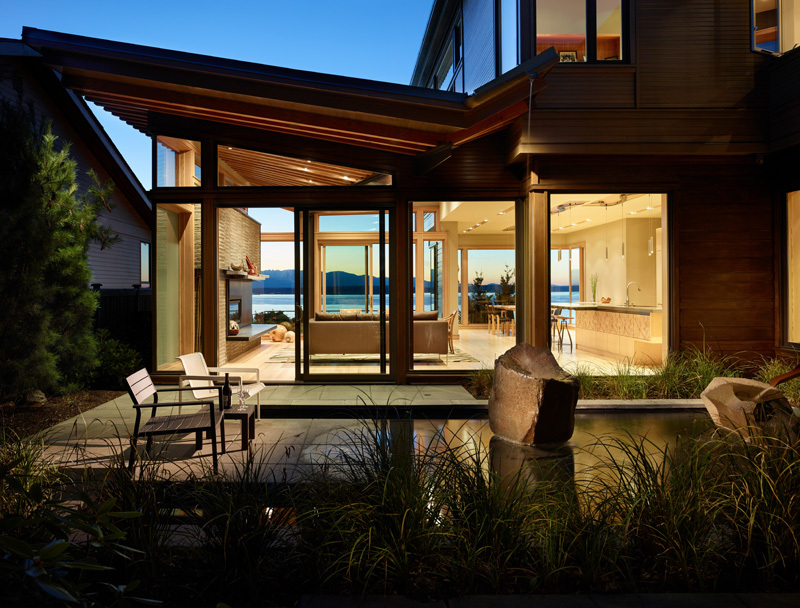 The architectural massing of the house has been wrapped around a south-facing courtyard containing a large reflecting pool with two “floating” basalt boulders. The reflecting pool gathers all the roof drainage from the house, with the downspout from the living room roof providing a 10-ft waterfall. 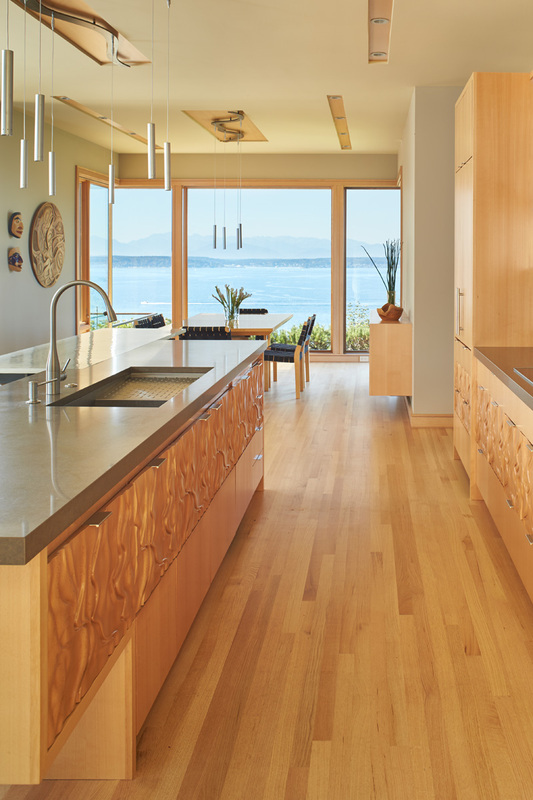 The main living space has sweeping westerly views of Puget Sound and the Olympic Mountains. 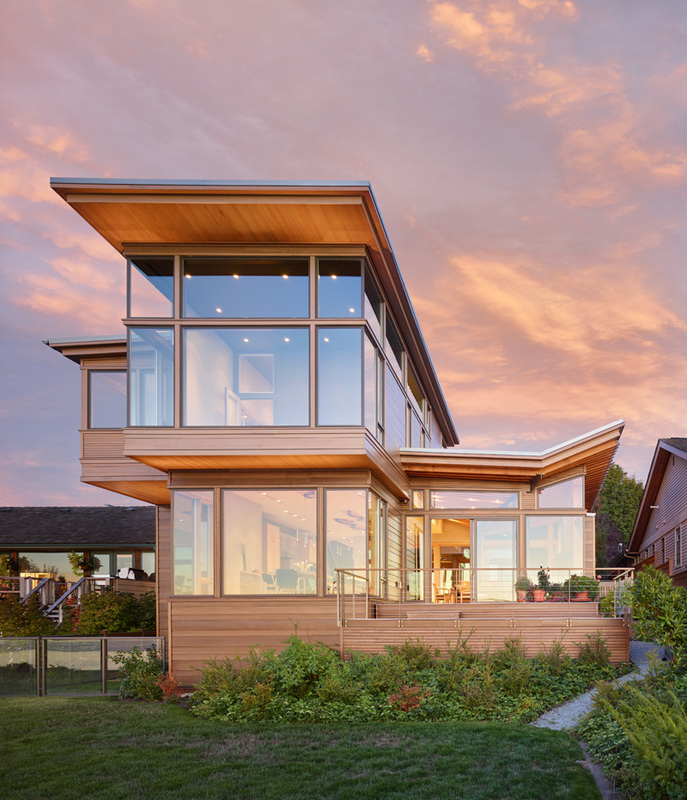 The east side of the living space is the courtyard with reflecting pool, providing a sense of intimacy and quiet in contrast to the dramatic views on the west side. 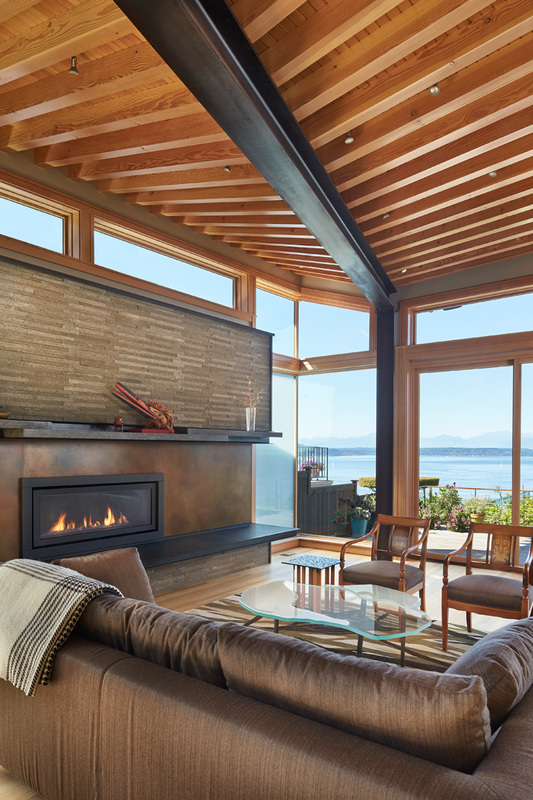 The exposed wood beams in the living space change pitch along the length of the room, providing a sense of drama as the roof unfolds toward the view of Puget Sound. 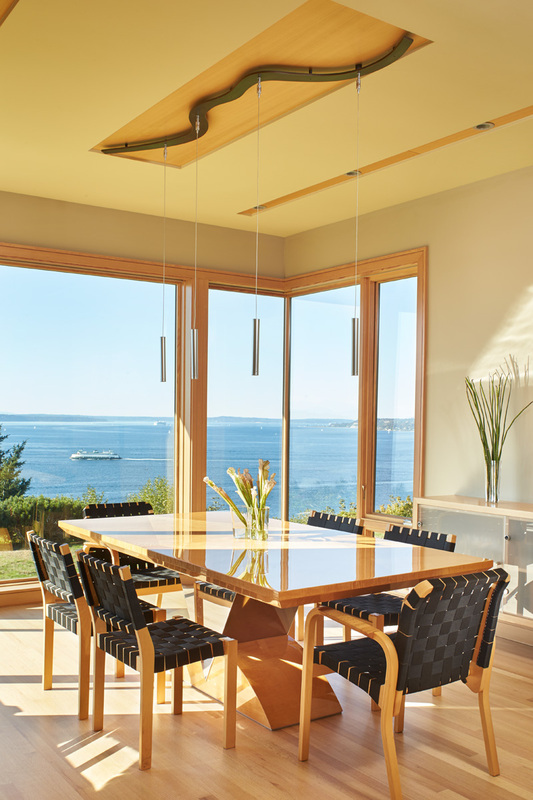 Upstairs, the master bedroom cantilevers out dramatically toward the Puget Sound view. 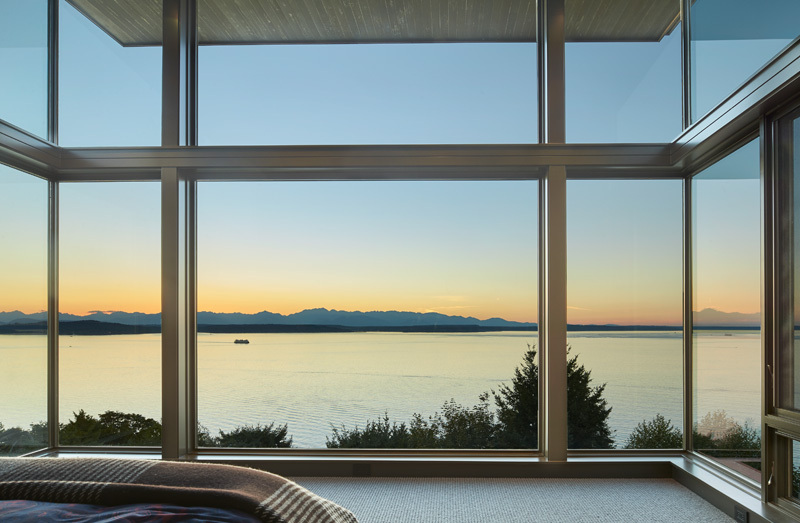 Tall glass walls wrap the bedroom on three sides, providing a stunning panorama of water and mountains. 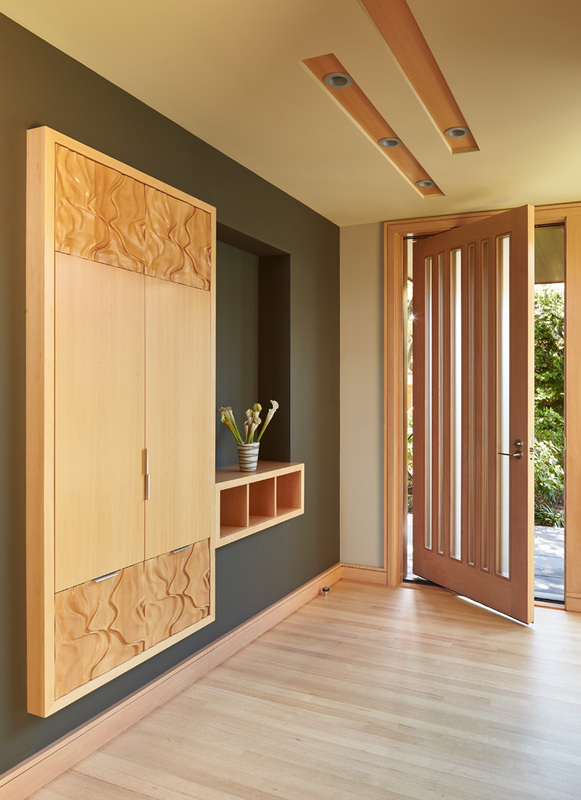 Similar to other FINNE projects, a strong sense of “crafted modernism” is present in the house. 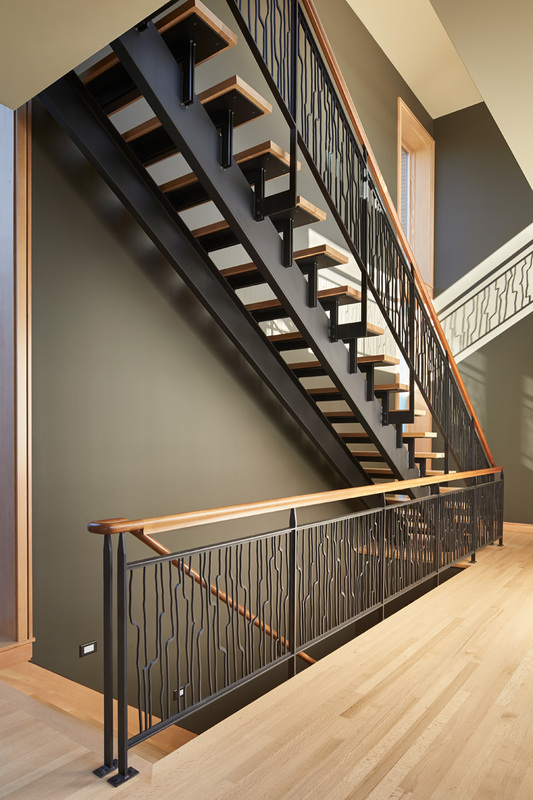 A water jet-cut steel fence and gate lead to the house entry. Stainless steel stands elevate the basalt boulders in the reflecting pool so they hover slightly above the water’s surface. 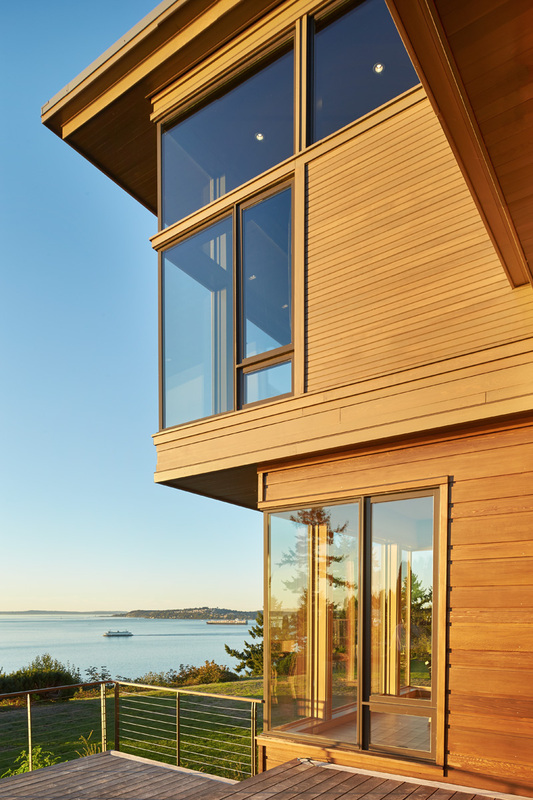 Exterior siding is custom stained red cedar with two different patterns and colors. 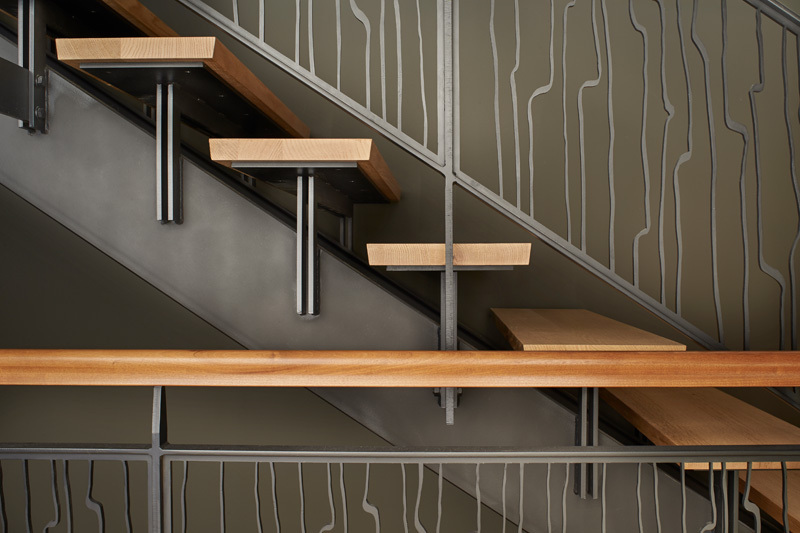 The striking steel and wood stairs have water jet-cut steel railings with a pattern based on hand-drawn ink brush strokes. 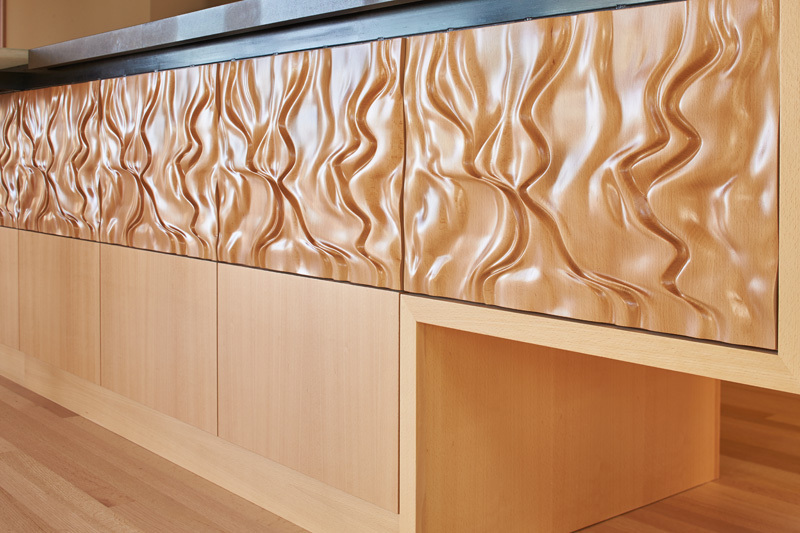 The beech interior cabinets have a custom topographic CNC-milled pattern called “imaginary landscape.” Freeform steel lighting bars in the ceiling tie together the kitchen and dining spaces. 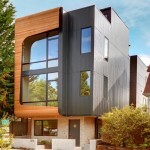 The house is highly energy efficient and sustainable. All roof drainage is directed to the reflecting pool for collection. 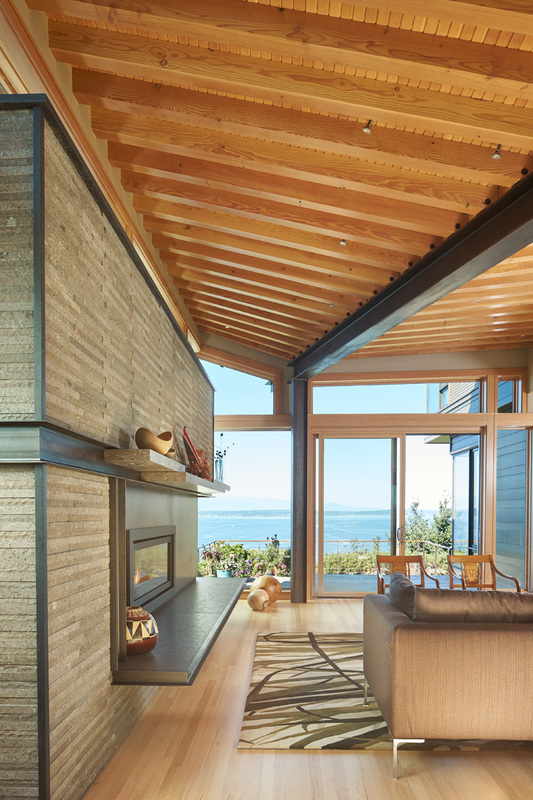 The house is insulated 40% higher than code. 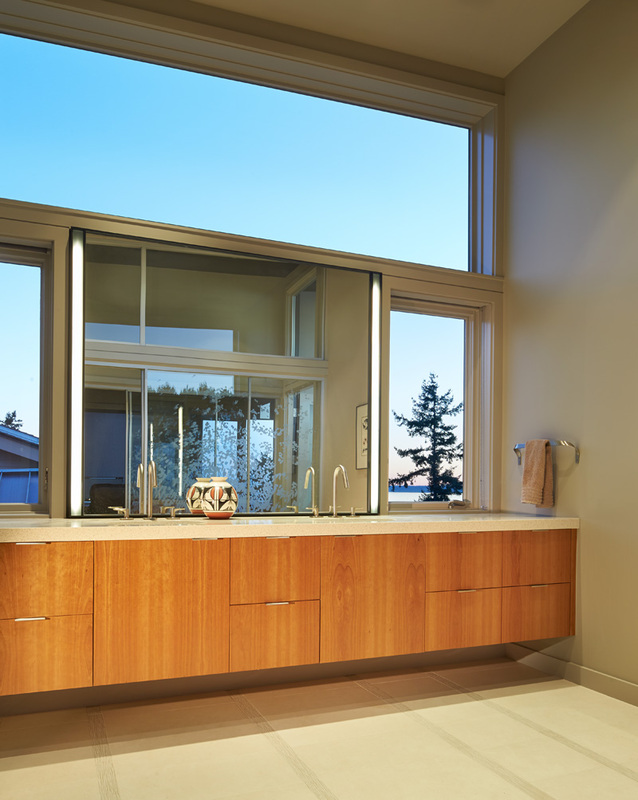 The radiant hydronic heat system allows lower operating temperatures and higher occupant comfort levels. 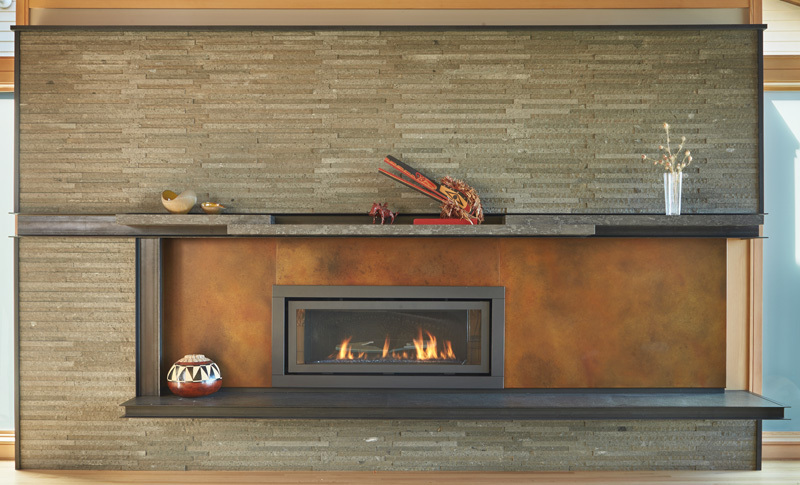 The “gypcrete” for the radiant tubes conserves heat and provides great warmth and comfort for the feet. 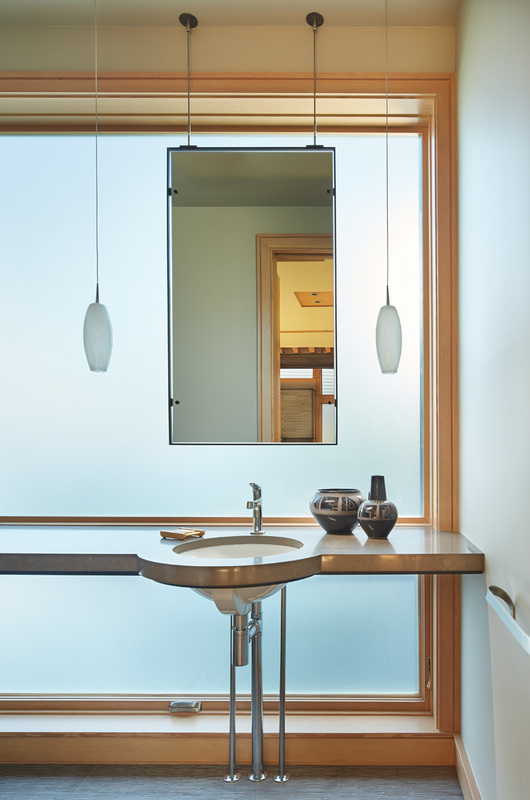 Generous glass areas provide natural lighting and ventilation; large overhangs are used for sun and rain protection; interior wood is FSC certified; LED lighting and water-conserving plumbing fixtures are used throughout the house. Windows have built-in shading. The house has been pre-wired for photovoltaic roof panels, and an electric vehicle charging station has been installed in the garage.